The North Island of New Zealand holds a treasure missed by hikers who limit themselves to the south Island. It’s the Tongariro Alpine crossing, a day hike among volcanoes—some dead, some smoldering, and all with an otherworldly feel that recalls the moon. The crossing sits atop Tongariro National Park, in the middle of the North Island. The night before my wife and I did the crossing, we stayed in the park at the Skotel, New Zealand’s highest hotel. Carrying lunches prepared by the kitchen staff, we rode a van to the start of the crossing. The van met us at the other end, some seven hours and 12 miles later, and returned us to the hotel for a second night. For variety, this hike is hard to beat. At first you walk gradually through a landscape strewn with jagged ejecta from a nearby volcano. Then you climb steeply to the first crater you cross. From there you pass Red Crater’s gash in the earth and faintly sulfurous, ghastly-colored lakes. You don’t belong in this alien place—and the sensation is thrilling. You return to familiar earth on a long, gradual descent that keeps you looking out at spectacular views of distant lakes and mountains. This hike is manageable for anyone who does more than walk the dog. Except for some rocky patches and a stretch of loose volcanic ash, the ground is firm and well maintained. My wife and I, in our early 70s, did the crossing last year on our seventh trip to New Zealand, where we visit relatives. We have taken longer hikes: New Zealand’s Milford Track and our own Grand Canyon. 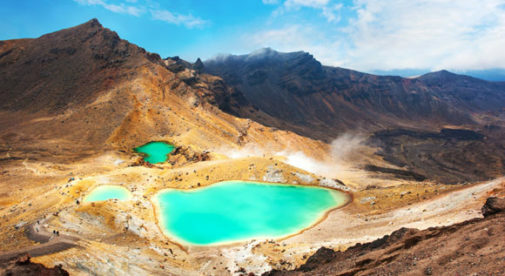 For a one-day adventure, though, our favorite is the Tongariro walk through primordial earth. For a North Island day hike that’s less strenuous but no less dramatic, there’s the roadless tip of the Coromandel Peninsula. If you like walking near water, you’ll love the Coromandel coastal Walkway. A van takes you from Coromandel Town along the stunning coastline to Fletchers Bay, where you continue on foot. Some four hours and 10 miles later, you reach stony bay for the ride back to town. The peninsula feels remote, yet the drive from Auckland is just over two hours. Learn more about all the countries on our beat in our daily postcard e-letter.